The Gemco 957 BRIK Series Magnetostrictive Linear Displacement Transducer (LDT) is a linear position sensor for highly accurate continuous machine positioning in a variety of industrial applications. This position sensor is built to withstand the demanding processing challenges, regardless of application or operating environment. The highly versatile 957 Brik Series offers absolute accuracy and reliability with high resolution and precision repeatability. The non-contact design allows this device to be used in highly repetitive applications without mechanical wear. The 957 BRIK Series is available with Analog, Digital (Start/Stop, PWM & Control Pules) and Serial Synchronous Interface outputs, and offers competitive style connectors for truly drop-in replacement. 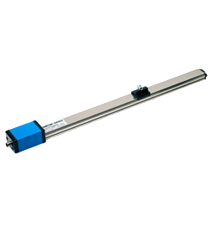 This linear position sensor utilizes our field-proven Magnetostrictive technology to give absolute position, accurate to 0.01% of the programmable sensing distance. All units have a diagnostic LED to display the health of the unit and to help aid in troubleshooting. Units can be ordered in span lengths from 1” to 180” in 0.1” increments. Applications include: Presses, injection molding, lumber, extrusion, roll positioning, dancer control and many more.